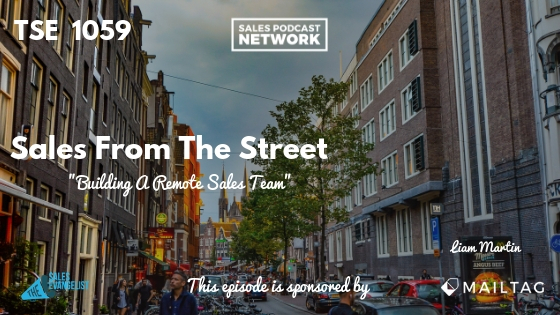 TSE 1059: Sales From The Street - "Building A Remote Sales Team"
For business owners looking to scale their efforts, there are important factors involved in building a remote sales team, and implementing them can mean the difference between success and failure. Liam Martin runs three companies related to managing remote workers: TimeDoctor.com, Staff.com, and his passion project, which is a conference on building and scaling remote teams. His organization helps companies monitor their remote employees’ productivity and efficiency. He points to the fact that, early in his career, he waited too late to build a sales team, which is the meat-and-potatoes of his business. Founders of a company have an understanding of the product or service that most sales reps won’t have. Founders may recognize as many as 10 different problems that you could tailor your product around or have meaningful conversations around. Sales reps won’t necessarily recognize that many problems, so they may not have access to as many meaningful conversations. The key, then, is hiring a proper sales manager. Sometimes the founder’s ego causes him to believe that he can effectively run a sales team, and he doesn’t recognize his shortcomings. You must take a hard look at yourself and determine whether you’re truly a good sales leader. When Liam recognized that he wasn’t a good sales manager, he fired himself and hired a proper sales manager. Be honest enough to determine what you can best do for your organization and then do that. Liam’s company has three different stages of hiring remotely. He suggests that many remote teams aren’t as effective as the leadership believes they are. Liam points to the bullpen, or the area where junior employees are grouped together in a single workspace. The idea is that the employees will train and work together and benefit from one another’s experiences. 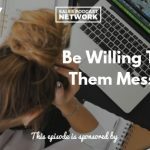 Remote employees don’t have a bullpen so it’s impossible to pick up nonverbal selling techniques that some employees are successfully using. 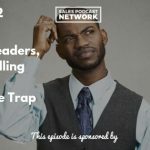 Everyone is disconnected, so very often these sales teams won’t hit quota despite their training. As a result, they leave the company. To solve the problem, Liam’s company works with remote salespeople for about a month. During that time, he has to either close an inbound deal or generate some kind of outbound activity. Based on that success, the company decides whether to invest more into the employee. He says that although it’s an expensive system, building a remote sales team is ROI positive. Successful remote employees must be self-motivated. Once the company hires a new remote employee and decides to invest in him, the company flies him to the sales manager in Canada where he will train in the office for three months. The employee will either hit quota by the end of three months and will have a job, or he will not hit quota by the end of that time, and he will go home without a job. From that point, the system rewards good salespeople financially. Successful sellers will earn more with this company than they will at other companies. At the same time, the pay structure is such that unsuccessful sellers won’t be able to survive. The first three months, then, are critical to the seller’s success. Creating the bullpen experience has helped the company’s remote sellers be more successful. Additionally, the company allows any employee to jump in on any Zoom call to ask for help or guidance. Liam points to a need to identify those sellers who can talk the talk but can’t walk the walk. Because the company is making a massive investment into its new hires, it must be able to quickly determine which employees are likely to be successful and which ones are not. On average, his company has found that it can take anywhere from three to six months to determine whether an employee will be successful. Its goal is to shorten that period when possible. The company would prefer a clear “yes” or “no” to a “maybe.” The more time it spends dealing with an employee who is a “maybe,” the more money it invests without fully knowing whether it will get anything in return. If you want to learn more about building or scaling a remote team, visit runningremote.com. It’s a conference being held in Bali, and if you’ve never been to Bali, it’s another great reason to go. If you’d like to get in touch with Liam, he’s excited about his interactions on YouTube right now, and you can find him at youtube.com/runningremote. After consuming the content, feel free to ask questions in the comments and he’ll be happy to respond.